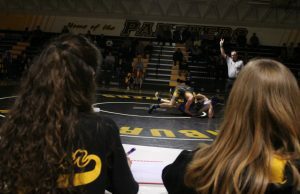 As the wrestling season comes to a close, Newbury Park walks away with the title of Marmonte League Champions. Now, the Panthers have time to reflect on the season and what they accomplished. After defeating Thousand Oaks by 12 points in a 43-31 victory on Jan. 19, the Panthers were able to capture the Marmonte League title, their second title in a row. Kilbane has been coaching the team for the past few years, and is extremely happy with the team’s progress and how they reached their goals. While the wrestling season was quite tough, Kasra Memarzia, junior, was proud of his personal accomplishments. “My goal was to make it through the season, and see if I would like it enough to do it again. I also wanted to have a positive win to loss ratio, and I achieved that,” Memarzia said. Memarzia also believes that the wrestling season has helped him build on his teamwork and leadership skills. 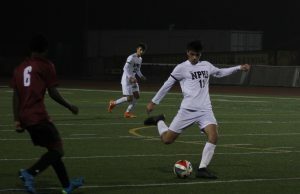 “To see leadership in another sport and another group, it changes the way I can help others as well as showing work ethic and commitment,” Memarzia said. 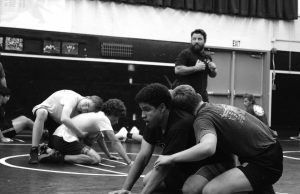 While some wrestlers mainly enjoy the leadership of the sport, other wrestlers, such as Urias Molina Merlo, senior, participate for a different purpose. Merlo also played his part in the team’s title this season, pinning several opponents across a variety of teams. He also believes that wrestling has helped his character develop.